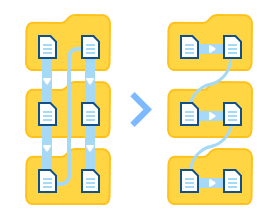 FolderMill can really optimize your document management and paper-based workflows. If you often use FolderMill to convert or print PDF, Word, Excel or other documents, or perform other document-related tasks, this guide can help you work faster and make things easier. Here are some FolderMill features you might not know about. Q: How to add original extension to file name of an output file? Is it possible to set up file processing in the following pattern: the incoming file changes the file name to [original name with extension].pdf after conversion? For example, if a text file "Document.txt" is placed into a Hot Folder, the output file should be titled "Document.txt.pdf". Afterwards add Convert to PDF Action in the same Action Set. Thus, your files will be renamed as [original name]. [original extension] and then converted to PDF. The output file will be titled as "Document.txt.pdf". Q: Is it possible to distribute different page ranges of a document to different printer trays? We work with DOCX documents. We need to have the first page of each document printed on Tray 1, and the rest of the pages - on Tray 2. Is it possible that FolderMill can use these printer settings? Set page range = 1 and for one Action and page range = 2-9999 for another one. For each Print document Action select the corresponding tray and make other printer settings, if necessary. Therefore, the first Print document Action will print only the first page of a document, and the second Print document Action will print the rest of the pages starting from the second page. Q: How to evenly spread load on multiple printers when printing large volumes of documents? We routinely print shipping orders which consist of 1000+ one-page documents as a single print job (in PDF format). Can FolderMill distribute printing them across multiple printers in order to speed up the time of the job? We do not care about the order of the pages, but timing is essential. A: If you print separate multiple documents, which should be evenly distributed among several printers, you can create three Hot Folders with Print document Actions assigned. Place more or less equal batches of documents into each Hot Folder. E.g. if you have 1000 documents - place 350 into the first Hot Folder, 350 to the second one, and 300 to the third Hot Folder. Q: Is it possible to set up a secondary "failover" printer for each Hot Folder which can be quickly switched to in the event when the primary printer is failing? It doesn't have to be automatic, but having pre-set printer configuration values would really save time during peak trading periods. Switching to another printer would let us quickly resume printing processes and continue production. Q: How to print documents of specific page formats (e.g. A0-A2 and A4) only? We have a Hot Folder configured to perform different tasks, and we would like to set up printing documents only of A0, A1, A2 and A4 format, and exclude all other files from processing. Is it possible to make such a filter in FolderMill? A: Yes, you can configure FolderMill, so that it prints or converts documents of a certain page size or format. Create a new Hot Folder, then create a new Action Set, and add Filter by Paper Size Action in the beginning of an Action Set. You can set custom page dimensions or a popular file format and use operators, such as <, > or = to specify a range for including or excluding particular documents. Afterwards, add another Action, e.g. "Convert to PDF" or "Print Document" as a following Action. Q: How to add leading zeros to the beginning of a filename? We split PDF files into separate pages and need to sort them by name after conversion. Is there a way to modify the way these pages are enumerated? A: You can adjust page numbering for output file pages and add leading zeros to them. By default, files are numerated like this: Document 01, Document 02, … Document 10. Please contact us, if you need to set up another file name pattern. Q: Is there a way to add new files immediately to a Hot Folder? In order to instantly send files to a Hot Folder, simply select them and right-click. You will see a line "Process with FolderMill" and can choose an existing Hot Folder to send your files to. Just make sure that you have "Add to Windows explorer context menu" checked on FolderMill installation. If you missed it - just reinstall the program. No worries! Your Hot Folders and previously made settings will be kept safe. Q: Is there a way to add pages to the beginning or end of an existing PDF and TIFF? Sometimes we need to merge our files: insert pages to the beginning of multipage PDFs and append new files to our existing TIFF images. Can you do it with FolderMill? You can do the same when converting to TIFF format - just select Append to existing TIFF file or Insert before existing TIFF file in the Convert to Image Action parameters. Q: How to print files placed to a Hot Folder via the Internet? Can I print remotely? We need to print to a printer or send documents to a printing machine in another office. Is it possible to set up remote printing with FolderMill? A: FolderMill is based on Hot Folders, and you can quickly set up remote printing over the Internet. Share a folder online using a cloud service such as Google Drive, Microsoft OneDrive or Dropbox. Then just copy new files to a shared folder, and instantly get files printed or converted on a remote printer or workstation. Using our detailed guide in the Solutions section, you can print or convert your files from any device — a PC, a laptop, a tablet or a smartphone. Q: Can FolderMill merge all TIFF files in a subfolder to a multi-page PDF file and name the PDF by the subfolder name? In other words, is it possible to configure automated conversion so that the merged PDF file adopts the name of the input folder? A: FolderMill has different options to automatically combine multipage files. One of the ways is appending all files to the one multipage file using subfolder name. To create multi-page PDF or TIFF arranged by subfolders (each file in a separate folder with the same name as the file), use two Actions: Rename document Action with a special macro + Convert to PDF with Append to existing PDF file option. This way you can create sets of documents or add new data to existing documents. Q: We have an issue where a document needs to be printed multiple times in different formats: single-sided, double-sided, single-sided stapled and double-sided stapled. Is it possible to direct them automatically using predefined settings? A: If you have a printing device with document finishing options such as stapling, you can control these settings too when using FolderMill. You'll usually find the finishing options in your Printer Properties menu. E.g., if you want to staple output sheets, enable this setting from Print document Action > Select printer > Settings. To set unique print settings for each group of documents, create two or more parallel Print Document Actions with stapling set to "none", or "one staple", "two staples", etc. Although such options cannot be set directly in FolderMill (except for collation), FolderMill can save your print driver settings in each Action and route documents via filters and/or different Action Sets. Q: We add multiple documents to several Hot Folders during the day and start FolderMill to automatically convert and print them to different printers. But they often get mixed when being printed. Can we configure the program to process all files from a Hot Folder before going to the next one? If you don't see this line, go to Hot Folders and open general settings by pressing Ctrl + Alt + G. Find line SimpleInterface=1 and change it to SimpleInterface=0. Then FilesProcessedPerCycle will be available in each Hot Folder settings.